Lock in a great price for Cascade Wellness & Lifestyle Resort – rated 9 by recent guests! The grounds were gorgeous. It was very luxurious staying there with a spa, three pools to choose from, tennis, golf and even a fun game room which we used. They gave us a welcome drink in the bar and it had a beautiful view as we watch the sunset. The beds were so comfortable. The bathroom was spacious and provided a bidet and a tub as well as shower. The bathroom was broken into two rooms. There is a walking trail right off of the property that goes along the cliffs all the way to Lagos. That too was a highlight of our stay. We had an apartment and we were able to buy food and have a huge selection of groceries in town and then cook for each meal. 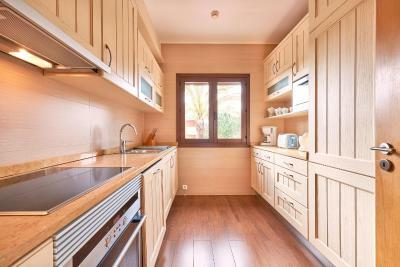 The kitchen had supplies that were ample and tons of cupboard space for your groceries. It also had a freezer and a refrigerator. Great location right along the coast, awesome to walk along the cliffs. Rooms were spacious and well kept. Nice facilities and close enough to town to take a quick taxi or even a nice walk. Great location, very friendly and helpful reception staff. Apartments very modern with good layout. Pool areas very well maintained. The surroundings, the pool, the one room apartment was very comfortable with a very well equipped kitchen. 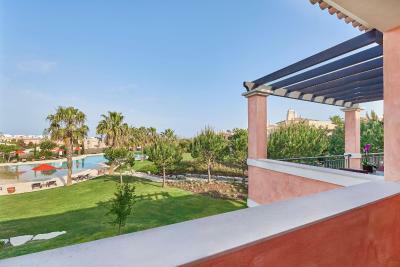 Awesome property situated at prime location of cliffs/beaches of the Algarve. Hotel is beautiful! Breakfast is well worth the $18 Euros. Book the day before. Staff is very attentive. Our family of 4 had Spa services. Best hot stone massage ever. We made use of hotel van. Same cost as a taxi. Our first day we had van take us to the super market for wine, cheese, meats, etc. our unit had a full kitchen. 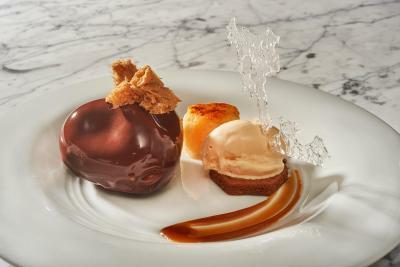 There are not a lot of food options within walking distance of hotel. Our only regret is that we did not stay longer. I rate Cascade resort 5 stars plus! Beautiful spacious apartment with all possible kitchen equipment. L'Occitane products and underfloor heating in bathroom were a very nice touch. Due to flight delays we didn't check in til 1am and staff could not have been more helpful. The location and parking were convenient, and Casacades was well sign posted from motorway. The gardens and pool areas were also really well maintained. Such a amazing luxury great place to stay! Beautiful location just a few minutes walk or drive t the best beach we think in the area. Really friendly staff! Such nice cleaning staff. Beautiful pool area with great clean nice water. Delicious breakfast! Will stay again if I’m ever back! Stayed in a two bed apartment that was fabulous. Really spacious and so many kitchen utilities etc were provided. I could not fault the apartment. The pool area etc was fabulous. Cascade Wellness & Lifestyle Resort This rating is a reflection of how the property compares to the industry standard when it comes to price, facilities and services available. It's based on a self-evaluation by the property. Use this rating to help choose your stay! 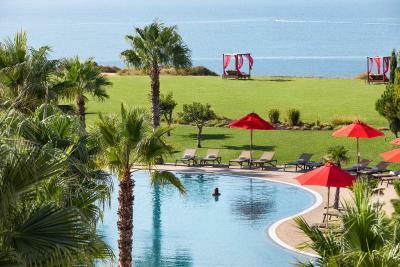 One of our top picks in Lagos.Set among gardens with an outdoor pool, Cascade Wellness & Lifestyle Resort overlooks the Atlantic Ocean and the nearby Porto de Mós Beach. It features a full spa with beauty and massage treatments, hot tub and sauna. 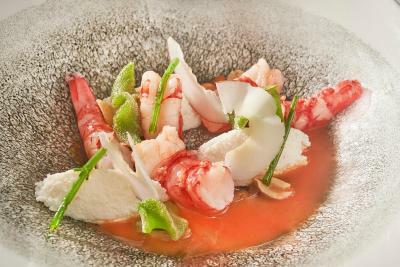 All air-conditioned rooms at Cascade Resort reflect the style of the 4 Continents, inspired by Portuguese explorations. They all open out onto panoramic balconies and are equipped with a satellite TV. 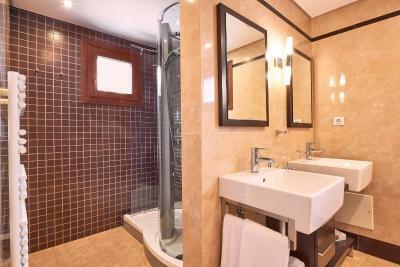 The private bathrooms feature underfloor heating and free designer shower products. 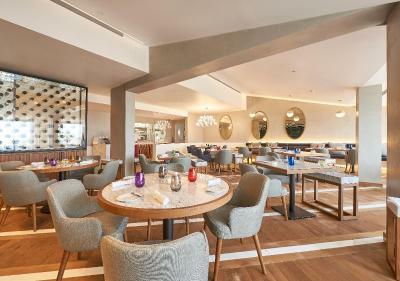 Algarvian food with a modern twist is served in 2 different in-house restaurants, both featuring a contemporary ambiance and views of the pool. 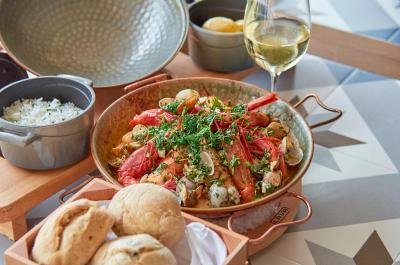 The menu is complemented by renowned Portuguese wine labels. The self-contained apartments and villas include spacious lounges and dining areas, as well as a kitchen complete with Siemens appliances. WiFi access is free in all accommodations options and there is also free underground parking. 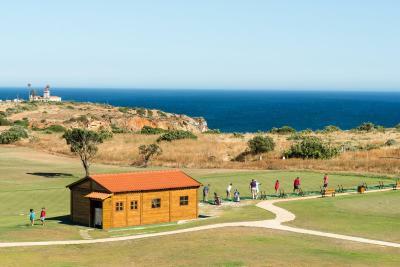 Boavista Golf Course is 1.9 mi away and Faro International Airport is 56 mi away. When would you like to stay at Cascade Wellness & Lifestyle Resort? This apartment overlooking the resort features a spacious bedroom and an private bathroom with underfloor heating and hydro massage bath. It has an exterior décor of Arabic and Algarve and features a terrace or a balcony, a kitchen, a dining area, a private garage and elevator access. It also comes with air dehumidifier. This apartment overlooking the resort features two spacious bedrooms and bathrooms with underfloor heating and hydro massage bath. It has an exterior décor of Arabic and Algarve and features a terrace or a balcony, a kitchen, a dining area, a private garage and elevator access. It also comes with air dehumidifier. This room features a terrace overlooking the landscape. The stone bathroom features floor heating. 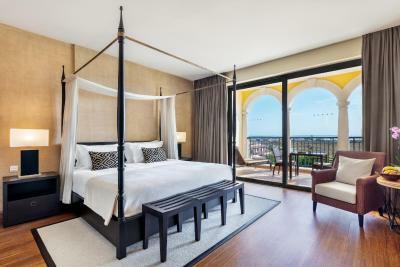 This spacious double or twin rooms with a décor inspired in the African, Asian or South-American continents includes a large balcony with resort view, a flat-screen TV and a bathroom with floor heating. There are two of these rooms specially designed and equipped for guests with disabilities. Please note that this room can only accommodate children up to 2 years old in a cot. This spacious double or twin room with a décor inspired in the African, Asian or South-American continents includes a large balcony with sea view, a flat-screen TV and a bathroom with floor heating. 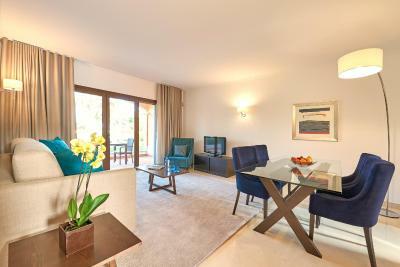 This suite offers Asian, Africa or South American style décor with views of the resort. It features a seating area with two flat-screen TVs, a sofa bed and coffee/tea making facilities. 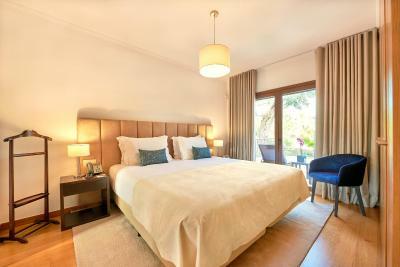 It also comes with a modern, private bathroom with floor heating and a spacious walk-in shower unit. Please note that the price is based on 2 guests. Maximum occupancy is 3 adults or 2 adults plus 2 children up to 12 years (see Hotel Policies for extra bed charges). 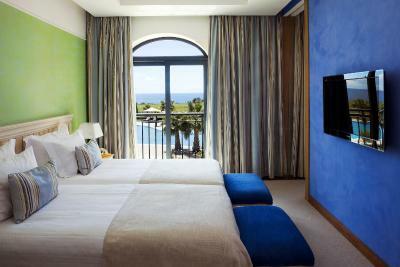 This suite offers Asian, African, South-American or European style decoration, together with Atlantic Ocean views. 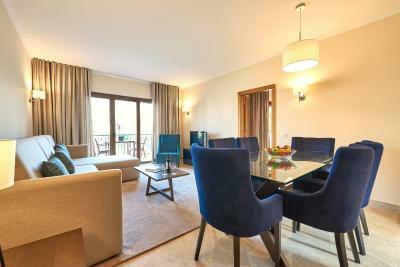 It features a spacious living room with a sofa bed, two flat-screen TVs, a coffee machine and tea making facilities. 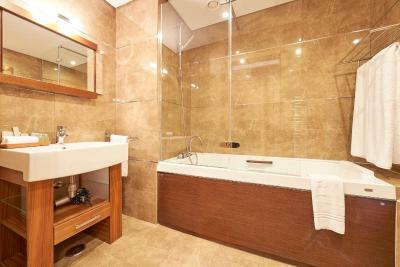 It also comes with an private bathroom featuring floor heating and a spacious walk-in shower unit. 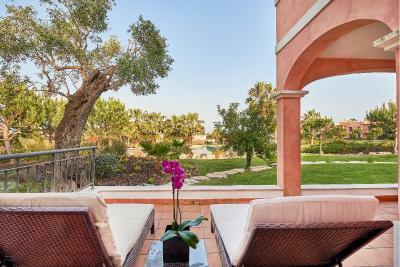 Featuring garden views and an exterior décor of Arabic and Algarve influences, this apartment has a spacious bedroom and an private bathroom with underfloor heating and hydro massage bath. The unit comes with a terrace or a balcony, a kitchen, a dining area, private garage and elevator access. This spacious double room with a décor inspired in the African, Asian or South-American continents features pool view, a flat-screen TV and bathroom with floor heating. This apartment has a bathrobe, tumble dryer and washing machine. This villa features air conditioning, satellite TV and bathrobe. House Rules Cascade Wellness & Lifestyle Resort takes special requests – add in the next step! Cascade Wellness &amp; Lifestyle Resort accepts these cards and reserves the right to temporarily hold an amount prior to arrival. Cascade Wellness & Lifestyle Resort accepts these cards and reserves the right to temporarily hold an amount prior to arrival. Please note that guests under 16 years old are not allowed to use the spa and gym facilities. Please notify Cascade Wellness & Lifestyle Resort in advance if any extra beds are required. Please mention this in the Special Request box when booking (see Hotel Policies). Please note that for early departures 100% total reservation amount is charged. Please note that double or twin rooms can only accommodate children up to 2 years old in a cot. Please note that payment of the total amount of the reservation is required upon check-in. Please note that extra beds for children between 3 and 12 years old or adults, are not included in the total price of the reservation. Please inform Cascade Wellness & Lifestyle Resort of your expected arrival time in advance. You can use the Special Requests box when booking, or contact the property directly using the contact details in your confirmation. Very small safety deposit box, not enough towel bars or hooks in the bathroom. Clean spacious room, polite and helpful staff, beautiful grounds with three pools, excellent breakfast, very good restaurant and gastropub. Just a couple of small things- the in-room safe is a bit on the small side and can’t take a small laptop. The bathroom door doesn’t have a lock. The hotel and grounds are beautiful and well maintained. Location is wonderful- sitting atop the cliffs looking onto the Atlantic. Walking distance to Ponte Piedade (exquisite), Dona Ana and Camilo beaches amongst others. The kids enjoyed the heated pool at the Spa from 10am-12pm. The others pools were too cold at this time of year especially with the strong winds coming off the Atlantic. We had an ocean facing suite. 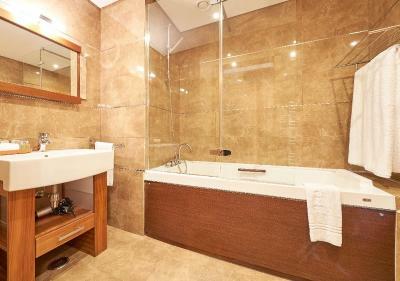 Spacious, well appointed (African theme) and a very nice bathroom with separate rainfall shower and bathtub. As Muslim travellers with halal dietary needs we do worry about breakfasts at European hotels. We were then so pleasantly surprised that despite not being able to have meat items, there was a huge variety of items available to more than satisfy our needs. Quality was also very good. Staff were very courteous and knowledgeable throughout. There is absolutely nothing we didn't like at this Resort. I was going to write that they needed to have darkening curtains and then realized that they had power shades on the exterior that blocked out the Sun. It was fabulous. Gorgeous grounds, attentive staff, comfortable apartment with kitchen and patio, free parking, good amenities, a few minutes' drive from old town Lagos, walking distance from two beachside restaurants. In its backyard is the famous Ponta da Piedade headland, one of the finest natural features of the Algarve. Location is outstanding for relaxation and exploration of the area. The hotel is remote to any local restaurant and shops and does require to have either a car or to book taxi. Prices of treatments in spa were very high. Big comfortable suites and great location, views etc.